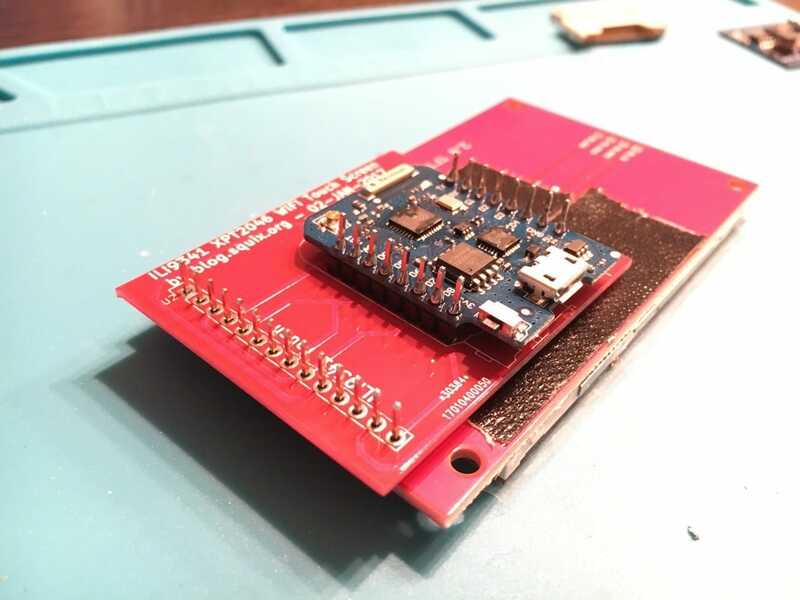 How to assemble and program the ThingPulse ESP8266 WiFi Color Display Kit. It is advisable to read these instructions carefully before you start soldering. In particular please make sure that you have all parts and tools ready. If you need help at any point with the following guide do not hesitate to reach out to ThingPulse and their community through https://support.thingpulse.com/. Here is the list of parts: display module (left), custom PCB (bottom right), WeMos D1 mini Pro (top middle) and the two pin header rows. Stack the parts up as shown below without soldering and adjust it until it makes sense. 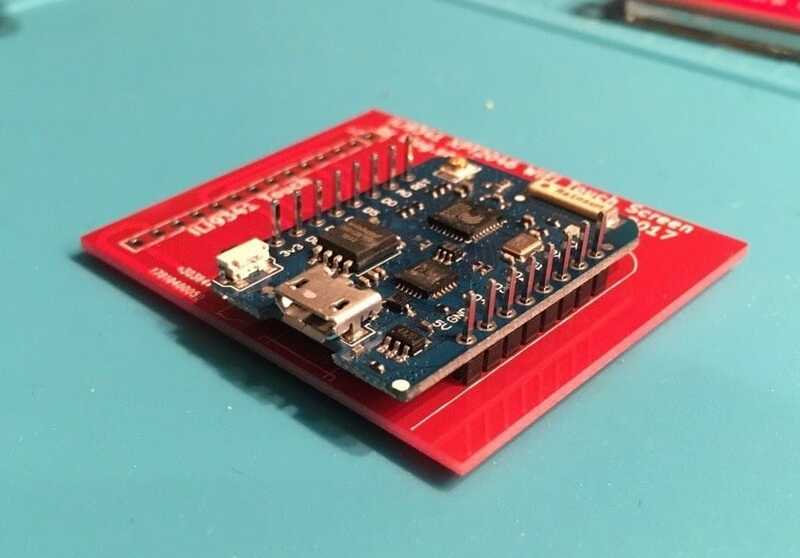 While you could insert the pin headers into the D1 mini like in the picture consider this: if you turned them upside down and inserted them with the longer end from underneath the D1 mini, this would allow you to later add an extension shield on top (there's a picture below). If you do not need that flexibility and want to place the pin headers like in the picture then you need to solder them to the D1 mini first. 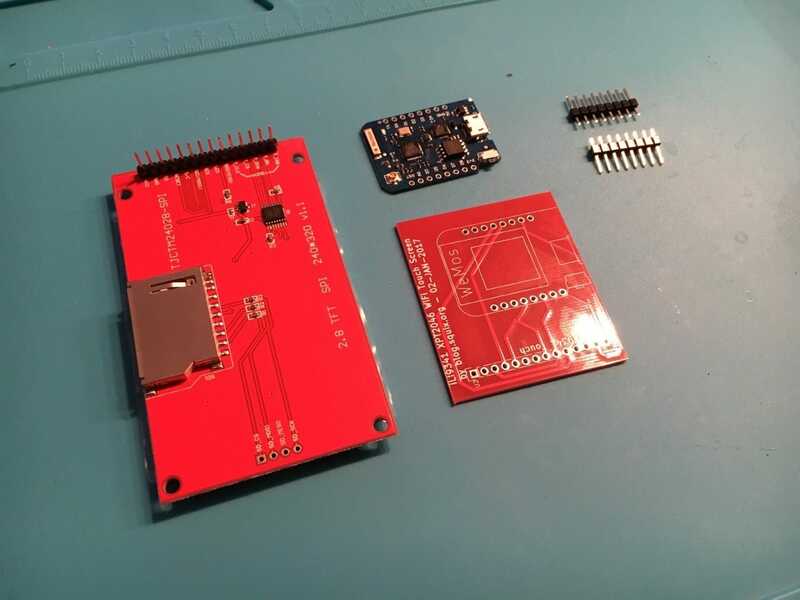 D1 mini-plus-headers are then soldered to the PCB. Otherwise the order is reversed. In order to get a stack which uses the least amount of space you will want to modify the display module a bit. The SD card holder has to go, sorry. 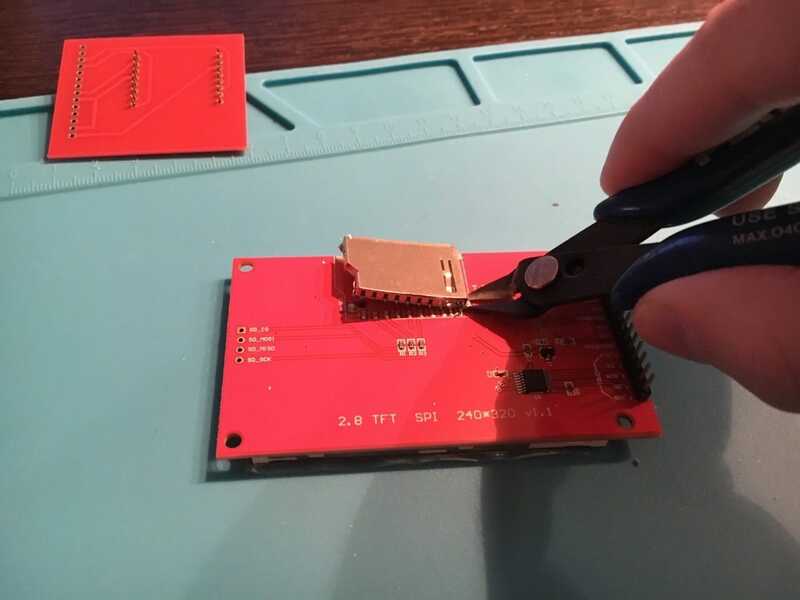 Depending on your (de)soldering skills you can either use a desoldering braid or just cut the SD card holder off with pointy cutting pliers. To prevent the D1 mini from accidentally causing a short circuit with the display board you can tape off the area below the connector board. 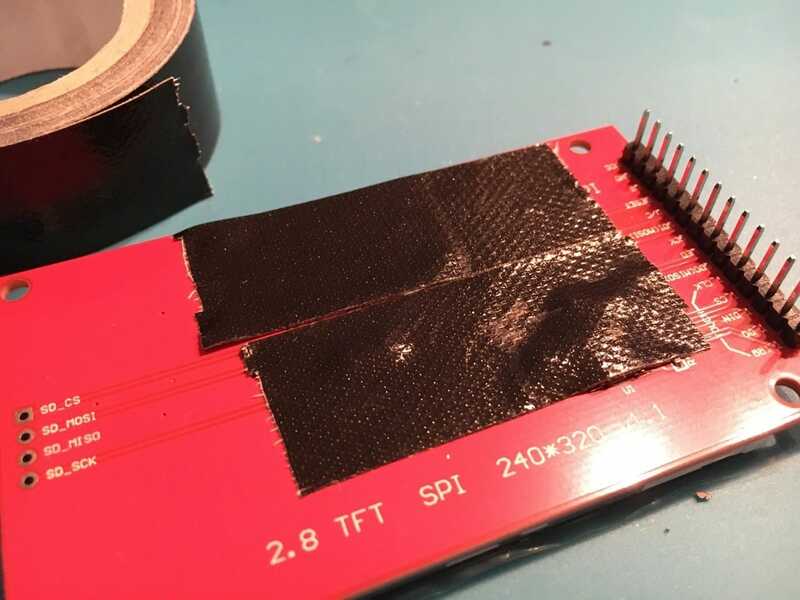 In the last step of the hardware setup you will solder the connector PCB to the display as shown below. Here is a speed-up video with all the steps above. Note how PCB and display are connected in a more "space-generous" way. in Tools > Flash Mode select "DIO"
in Tools > Flash Size select "16M (15M SPIFFS)"
The ThingPulse Weather Station Color depends on a number of other libraries. They need to be made available to the Arduino IDE for them to be compiled and linked into the final application. With all the preparation done you will - finally, sigh - turn to the Weather Station Color project itself. Fortunately, this last step is a rather simple one. Download the sources from https://github.com/ThingPulse/esp8266-weather-station-color/archive/master.zip and unpack them somewhere to your local file system as esp8266-weather-station-color (erase '-master' in the folder name). 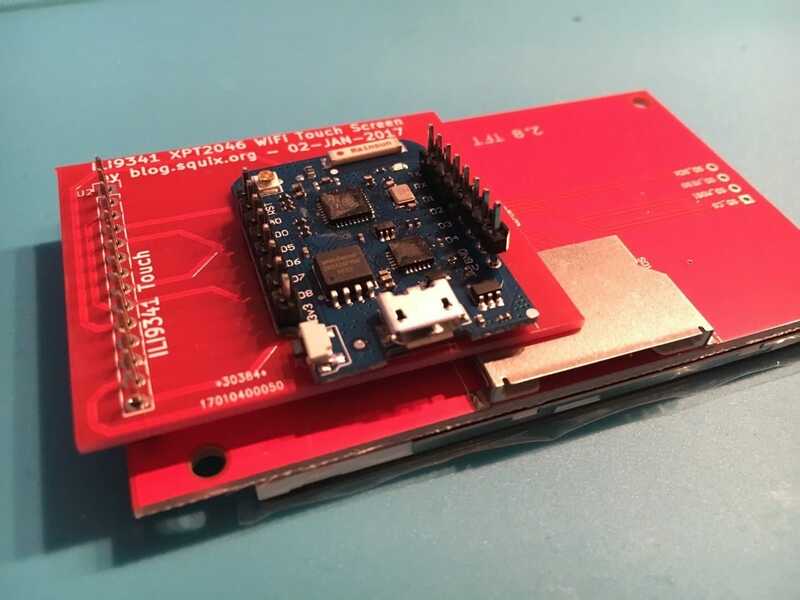 find and select esp8266-weather-station-color.ino from the previous step.